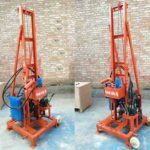 The HZ-130/180/200 Series drilling rig is a kind of portable core drilling machine with a wide range of applications. It can increase the shift slip of the drill rig and achieve rapid replacement of the drill tools to improve working efficiency and reduce labor intensity. As a high-speed drilling machine, the model is suitable for drilling water wells, general exploration, geophysical exploration, road and construction exploration and other drilling projects such as blasting holes. Customers can choose alloy, diamond or composite drill bit according to different substratum. 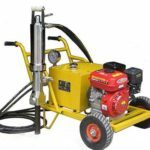 It can drill 2-9 grade sandy clay and rock layers. The model uses the hydraulic automatic feeding mechanism which can improve drilling efficiency and reduce labor intensity of workers. Using the ball clip mechanism to replace the chuck which can inverted lever without stopping the machine. It’s very easy to operate, safe and reliable. The hoist is equipped with a retainer to form the structure of double supporting star wheels, which can withstand strong impact. The vertical axle box has four sets of bearings to ensure the rotator is rigid enough to cope with complex geological conditions, such as gravel layer and pebble layer. The machine adopts the taper clutch of national patent technology, which has the features of big transmission torque, easy operation and no maintenance.